Elizabeth May's seventh book is a ramble through stories that have caught her eye in the media, her observations from the gallery of the House of Commons, and reminiscences of her time as assistant to Mulroney environment minister Tom McMillan, and her encounters with politicians since her earliest days as an environmental activist. All of this is supposed to be linked to her obliquely punning title, which evokes the common claim that people have lost confidence in politics. Claimed loss of confidence, or faith, is a kind of feedback argument. The premised loss of faith is invoked to add urgency to whatever political criticisms you want to make, particularly of the working of political institutions, and those criticisms are used to support the claimed loss of faith. What surveys done recently, 30 years ago, 60 years ago and 90 years ago establish the loss of faith? There has plainly been a loss of party attachment. Lifelong Liberals or Conservatives are few now, but, when there were many, people had confidence in their lot and none in the other lot. There is no ground for saying they had more confidence in politicians or politics generally. Decline in voter turnout, a favorite theme, may mean any number of things. It may as well mean that many are prepared to trust anyone who might win an election as none. May is severely and fairly critical of Stephen Harper's iron control of his government, his caucus and his party and ruthless political play. She does not allow that minority government, to which she is not surprisingly partial, adding a third cheer to Peter Russell's two, has fostered a continual election ready discipline. Moreover Harper's wicked ways, while plausibly linked to the substantial if not entirely relevant literature on concentration of power in the Prime Minister's office, bring their own remedy. They don't work. He was denied a majority and has imposed no agenda hidden or otherwise. 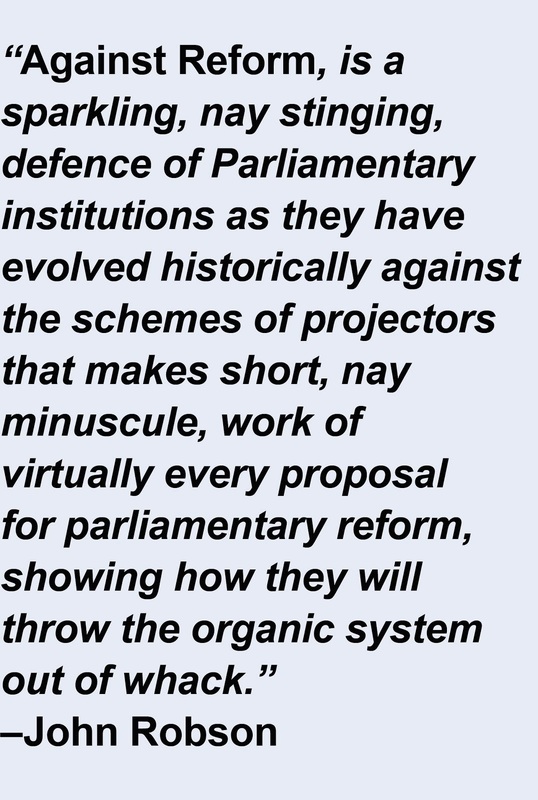 House of Commons committees have indeed "descended into farce" since 2006. But while the Conservatives have handled them badly, the root of the problem was the attempt of the opposition parties, in a kind of dry run for the Dion coalition, to use the committees to report bills that the government could not allow the House to pass, that the opposition could not have forced through without bringing down the government and bringing on an election, which they were not prepared to do. Conservative committee filibusters were a response to opposition attempts to advance sham legislation not intended to pass but to embarrass the government. The opposition parties did not conduct themselves so during Pearson's minority government, but that predates May's Canadian political memory. A chapter entitled "Police State?" goes over some of the scandalous failings of the RCMP, but it does not help that there is a faint air of paranoia in her claim that the RCMP acts to keep politicians off its back by their investigations of them and the publicity given those investigations. B. C. Premier Glen Clark's difficulties are instanced but the chief count in her indictment is the force's investigation of the leak of the Martin government's decision not to tax income trusts. May contends, as others have, that the announcement of the investigation, including the statement that there was no evidence connecting Finance Minister Ralph Goodale with any wrongdoing, coming halfway through the 2006 election campaign, when the Liberals held on to a slim lead, turned the election against them and was intended to do so. Paranoids do have enemies and there may be something to her contention, at least as to motive, if not effect. But she is too easily satisfied and does not persuade. With the pundits, the players and the government relations industry of which she is highly suspicious May, is fond of turning points, the events that shifted the polls. While many people make a good living purporting to identify these, the reality is that much of what shows up in polls during an election is simply the ruminating voters slowly focussing their minds on a decision weeks and then days off. Put simply, the opposition brought Martin's government down because they thought he was vulnerable and he tried to stave off defeat because he thought so too. No one was reckoning on Commissioner Zaccardelli turning the tide. Oddly, May's discussion of the RCMP omits its long investigation of Brian Mulroney over Airbus and says nothing of Harper's appointment of a Commissioner from outside the force, William Elliott, fifteen months before she began her book. Complaining of the "Americanization of our Election Process", May attacks attack ads and politics by polling. In doing so she accepts that they are effective: "the use of databases detailing voter intentions and inclinations has become a science." She states baldly that a single Conservative ad, the one showing the Dion voter as rolling dice, "all on its own persuaded 11 per cent of Canadians not to vote." She is, of course, a great admirer of Stéphane Dion and perhaps this explains why she joins with the Conservative wise guys and Dion himself in thinking that the attacks ads against Dion put paid to his leadership. But Dion's problem, and the Liberals', as they knew by early 2007, was that he was not a leader. In pointing this out the attack ads had little effect and perhaps gained him some sympathy. Here again, the remedy for attack ads and "scientific" polling is that they will not work. May does not propose that they be banned. May devotes more than a dozen pages to the story of her successful effort to be included in the leaders debates. Despite her professed attachment to parliamentary government and complaint of too much power for party leaders, she knows where her interests lie and is keen on these grotesque proceedings, which are the acme of the Americanisation of our elections. She comes near, with Andrew Coyne and Tom Axworthy, to advocating legislation for them, with perhaps regulations covering camera angles and make-up and what then? We shall not be allowed to vote unless we can prove we have watched the debates? I am proud to say I have never watched a leaders debate except at a barbecue in 2004 when I was diverted by divers partisans jeering at their party's leader. There is a chapter advocating proportional representation. 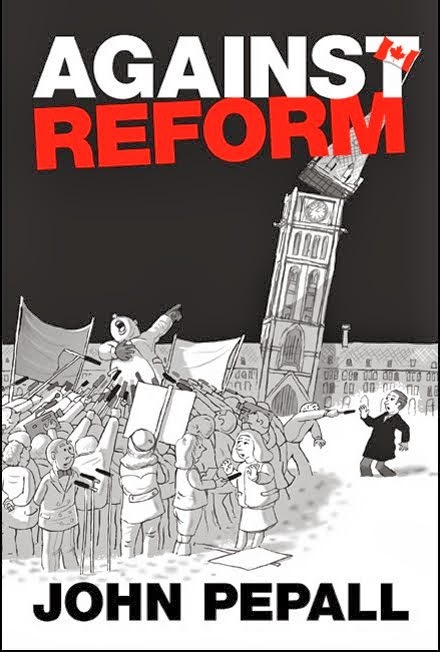 There are several books making the case for proportional representation in Canada, well organised lobbies advocating it and no shortage of people talking it up in the media. May adds nothing to this. She has somehow got it into her head that first past the post was invented in the 11th century and thinks that is pretty damning. One might counter more truly and as tellingly that proportional representation is a Victorian invention. After the trouncing of MMP in the Ontario referendum of October 2007 and STV in B. C. last May the Green Party will have to face up to the fact that for the foreseeable future it will have to make its way with first past the post. She criticises the media saying it treats elections as a game, worrying about concentration of ownership and finding all her critics unfair and out to get her, though most coverage of her as she became a national figure has been rather flattering. And she leans heavily on media contacts and journalists whose views she finds sympathetic, particularly Don Martin of the suspect National Post. What seems to disturb her is not that her interests and ideas are not reflected in the media but that others are. Happily she proposes no remedy. The final chapter praises coalition government. The Greens have a long way to go before they will have enough seats to coalesce with anyone. Evidently May would like to see a coalition with the Liberals. She protests that she never advocated strategic voting, but the deal with Dion not to run candidates against each other, her loathing for Harper and the appearance that she was as much distressed by Dion's defeat as the Green Party's failure to win a seat make it understandable that many, including Greens, understood strategic voting to be indicated. If the end of the Green Party is to be in a Liberal/Green coalition., at least some Greens will do as well to vote Liberal as vote Green. And they must ask themselves whether the final end of action on climate change and all environmental issues might not best be achieved by the party folding and its supporters investing their passion and understanding in the Liberal Party. Where that would leave Elizabeth May need not concern them. This review was rejected by The Literary Review of Canada as "mean-spirited". In fact I pulled my punches. Were Elizabeth May not a minor celebrity with a ready made following in the Green Party faithful such a spilling out of whatever was on her mind would not have been published. Had it come from the leader of a major party it would have been scoffed at. As it is, it was hailed by Lawrence Martin, particularly for its attack on the concentration of ownership in the media, which Martin, writing for CTVGlobemedia, alleged "very few are prepared to talk about". The Globe also gave it an enthusiastic review from environmental journalist Nicholas Ross. I restrained myself from remarking, amongst other things, on May's tendency to name dropping, from Bill Clinton, a friend for nearly forty years, and Al Gore, of course, to scores of M. P.s, of various stripes, and other lesser figures. Whatever the issue, we never get far away from what May was up to, though most of us had never heard of her until three years ago.